Content warning: This review contains descriptions of in-game violence. You’re an ape, you want out, and you’re gonna kill anyone who gets in the way. Quite the straightforward premise, no? 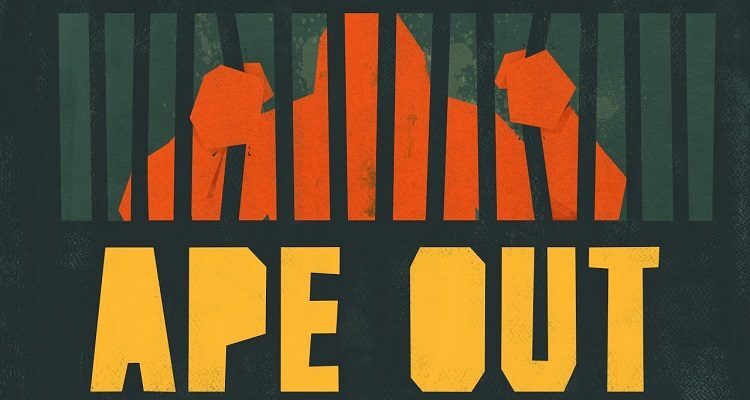 Made by Gabe Cuzzillo, Matt Boch, and Bennett Foddy, and published by Devolver Digital, Ape Out is an indie game about a gorilla’s violent journey to freedom. Hominids they may be, an ape only has so many options: shoving someone, or grabbing and then throwing them. Either way, it’s with such brute force they explode into a bloody mess upon impact with something. Grab someone and they’ll both become a human shield and fire their gun indiscriminately in a panic—an excellent way to keep up the flow of combat. Like the fever dream of George Taylor of Planet of the Apes. Ape Out has a musical bend throughout; levels are split up into albums, further grouped in an “A-side” and “B-side” as you make your escape. Each album has its own percussion-driven soundtrack—the jazz drumming accompanying the first set of levels is particularly fantastic. The soundtrack is dynamic to your actions, energetically keeping up with your pace as you run, and marking each enemy death with a flourish, such as a hit on a crash cymbal. The visuals are a riot of colors. The developers do brilliant things, like create levels in blackness where only the white light of enemies’ flashlights guide the way, which make levels feel vibrant despite graphics not being overly detailed. Level names fall or splash onto the screen in clever ways, and oh, is it slick when it all comes together. The game may be made by just three people, but the production quality feels like many more were involved. I don’t think screenshots necessarily do the game justice, so it’s best to see the game in motion. The controls are sometimes a bit imprecise, especially when right on top of an enemy—trying to pivot quickly to give them a good shove isn’t exactly smooth and can end in getting shot. You will die frequently, a scarce few bullets will put an end to your frenzy. Thankfully, respawning takes just a few moments, so it’s back into the action almost immediately. Getting a level run just right—dodge, shove, throw—feels ultimately satisfying. It’s like a score attack game, without a score racking up in the corner of the screen. Levels and enemy placement are procedurally generated each time, sometimes for the worse. On some levels I’d turn a corner and essentially be facing a firing squad with no time to react. Other times, the level would be laid out in a way that I could breeze through, killing just two or three enemies before making it to the exit. The game can be completed in a few hours, and I think that feels about right. New enemy types are introduced as you progress through the game that force you to change up play style slightly, but the core gameplay is still the same, and still quite simplistic. Near the end, it begins to drag. Much longer and it would have overstayed its welcome. Ape Out is a beat-em-up though and through, elevated by a most excellent soundtrack and a unique take. This is one indie game that’s worth a look. Ape Out is available on PC and Nintendo Switch.